Live broadcasting is all the rage these days. Facebook's doing it (and pushing it a lot), Instagram has recently added the capability too, and now it's Twitter's turn. Technically this isn't Twitter's first foray into live streams by its users, but what the company has unveiled today completely sidesteps any use of the Periscope app (which is also owned by Twitter). Instead, what you can do from this point on is stream live video from the Twitter app itself - if you're on Android or iOS. Just start the app, tap the Compose button, tap the Live option, and then you're taken to a pre-broadcast screen that helps you frame your shot. When you're ready to do the deed, just tap Go Live and that's it. You're now broadcasting live video to your followers from within the Twitter app. While you watch such a video, you can comment and send hearts by tapping the screen, which you can do to show your support for the broadcaster. The new feature is "rolling out to everyone on Twitter for iOS and Android over the coming days", the company says. 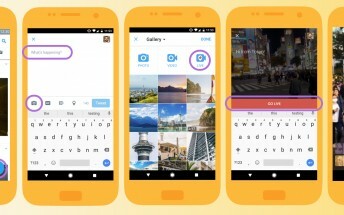 Twitter claims the live video function is powered by Periscope, but it's easy to wonder whether the standalone Periscope service and app are bound to go the way of Vine now that the Periscope brand is being deemphasized with this launch.